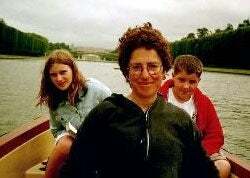 Rosanne Wasserman, flanked by Irene Lyla Lee and Joe Richie, on a rowboat on the Grand Canal, Versailles, July 2002. The inspiration for �Boustrophedon� begins with some pretty old tech. During a visit with my students to the new Greek and Roman Galleries of the Metropolitan Museum of Art, New York, we saw a vase on which boustrophedon letters had been painted beside the characters on the vase: names that sometimes read right to left, sometimes right to left, depending on the profile of the figure. The word means �ox-turn,� according to the Liddell and Scott lexicon, which is blissfully on-line. The scribe would reach the end of his section of parchment or tablet of clay, and instead of lifting his stylus to return to the side on which he�d begun to write, he would simply drop down a line and begin to write in the other direction: just as if he were driving oxen over a field to plow. I started the poem off by hand, which proved to be how I�d write the whole thing; once I started to type it up, I realized I was in trouble. Microsoft Word just had no idea about how to do what I needed. A colleague from the United States Merchant Marine Academy, Dr. Charles Schultheiss, lent me a copy of PhotoShop, which helped me to visualize what I wanted for the first twenty lines or so, but I was flipping every other line and pasting it in; the flipped and pasted letters were blurry and gray. The poem was still growing. I went back on line to search Boustrophedon, and the following site turned up. This marvellous location, created by Simmon Keith, would turn any prose text into a boustrophedon image. Alas, I had this poem that did not automatically wrap or justify: its line breaks didn't fit the program. I contacted Simmon, who generously not only rewrote his program to accommodate the poem's format (for which he's been thanking me! ), but also typed the poem up all over into the new program, gracefully bearing with my additions and revisions to the text. Once it was finished, we had to scale it to a readable format: a �tiny� one put the whole piece onto one page, but a two-page one was more readable and graceful. I was delighted that he had formatted the piece in such a way that the lines meandered across the page: my first time out behind an ox, I couldn�t hold the plow straight at all. I am now considering another poem in boustrophedon format, but with counted characters, so that the full-page image is more controlled. Bio: Rosanne Wasserman�s poems have appeared widely in anthologies and journals, including twice in David Lehman�s Best American Poetry series (Macmillan, 1988 and 1994), chosen by John Ashbery and A. R. Ammons.� Her books include The Lacemakers and No Archive on Earth (New York and Moscow: Gnosis, 1992, 1995); Other Selves (New York: Painted Leaf Press, 1999); and a forthcoming collection, Frequently Asked Questions.� A professor at the United States Merchant Marine Academy, Kings Point, she is the mother of the young poet Joe Richie (Endless Enchantment) and wife of the poet Eugene Richie (Island Light), with whom she has co-authored a book of collaborations, entitled Place du Carousel (Vilna: Zilvinas and Daiva Publications, 2001).� Together, they direct the Groundwater Press, a non-profit poetry publisher.